The formula for winter dressing seems simple: shirt + sweater + coat. But the quilted vest is a sort of wild card that exists somewhere between the three. It’s also one of the most versatile options for winter layering, and can be worn with everything from a casual flannel shirt to your sharpest suit. Here are just a few of the ways you can incorporate a quilted vest into your work and weekend rotation. 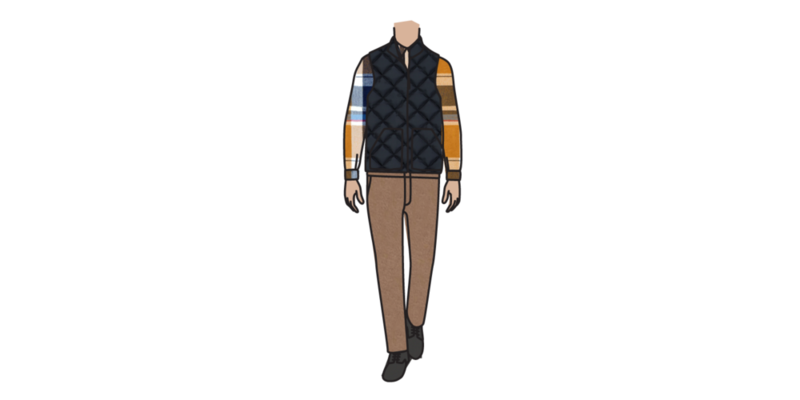 If the temperature is hovering between I-should-wear-a-coat and not-cold-enough territory, a quilted vest can act as a perfect compromise when paired with a winter-weight flannel shirt and chinos. The contrast between a dark, solid-colored vest and a patterned shirt will also lend extra visual interest to a simple outfit. Layering under a suit can be tricky. Sweaters can look bulky under a well-cut suit jacket, and cause strain in the shoulders and arms. Sweater vests will be easier to wear, but aren’t everyone's cup of tea. Consider the quilted vest a better alternative. As it’s designed to be worn as outerwear, it will provide more warmth than a sweater vest and will avoid some of the latter item’s poindexter connotations. And once you’ve reached the end of the commute, you can simply zip it off—no awkward, over-the-head acrobatics required. When forecasts are particularly dire, consider layering a quilted vest under a topcoat. It will provide the extra warmth perilous temperatures demand without being as bulky or constrictive as a parka. Plus, you can always still comfortably wear a suit between vest and topcoat if the situation requires it.